For too many Americans, Veterans Day is an opportunity to hit the department stores before Black Friday, or on a day like today maybe a trip to the beach. But by being here today, each of you is declaring that above all else, Veterans Day is about recognizing the service and loyalty and sacrifice and commitment of those extraordinary men and women who have worn the uniform of the United States Armed Services. And fortunately, throughout these United States, in bustling cities and in quiet towns, there are still Americans who are gathering this morning, as we do here, to remember and to honor the men and women who have served our country so that all of us, and others throughout the world, might live in freedom and safety. In Washington and in state capitols and in town squares throughout our country, there are majestic monuments to great military and political leaders who in some way have bent the arc of history. But Veterans Day reminds us that all of those grand achievements by the famous are made possible by those whose name history does not mark – the grocers and mail carriers and teachers and mechanics and students who were asked by their country to rise to the occasion – and they did. They were ordinary Americans who could have stayed home and lived a comfortable life with their families and friends, but instead they answered our country’s call and stepped up to serve a greater cause, and in doing so all sacrificed some, and some sacrificed all. If you’ve ever visited the D-Day landing beaches in Normandy, you can understand why books have been written and movies have been made about the vastness of that battle. You gaze out at the endless sea and you imagine it covered with all kinds of ships and landing crafts that made up the largest amphibious assault in the history of the world. You see the long beaches stretching into the distance, and you can envision them blackened with massive waves of troops -- 150,000 in all -- desperately scrambling forward. But when we think in scales like that, we can lose sight of the fact that even a world-changing event of this magnitude always comes down to individual people making the individual choice to overcome their terror and do the unnatural thing of putting their own lives in grave danger in service to their country. One person, charging out of the landing craft in the face of enemy fire. One person, scrambling for cover on the beach. One person, leading the way up the cliffs. One person – after another, after another, after another. So when you see the US cemetery, there or anywhere, with row after row after row of white headstones in perfect lines that seem to extend to the horizon, you realize that each of those markers is a monument at least as important to the history of our country as the grandest statue of a general or a president. Because everyone who lies under those markers, and everyone who returned with injuries, and everyone who donned the uniform in peacetime as well, have gained their place in the long and strong chain of sacrifice that connects one generation of ordinary American heroes to the next. It is a chain that began when the farmers of Concord put aside their pitchforks and picked up their muskets and forced the King’s troops to retreat at the North Bridge. It is a chain that extended through Gettysburg, through Okinawa and Inchon and Khe Sahn. And it is a chain that continues to this day in the chaos and violence of Iraq and Afghanistan and the danger that our forces are exposed to everywhere in the world. And each of you veterans here today, and every other American who has formed a link in that chain, across all the wars and all the generations, has played an essential part in building the nation we love. Over the course of our history, the world has certainly changed, and the threats to our country have changed, and the missions of our armed forces have changed. But the valor, the dignity, and the courage of the men and women in uniform remain the same, and so does the strength of their families who sacrifice along with them. Each of them, in each generation, has left a legacy of freedom, and they taught their children and their children’s children the value of sacrifice, and devotion, and service, and most of all, love of country. All of those who have served, both the living and the dead, have become our teachers. Through their service they remind us of the extraordinary potential of ordinary Americans. They remind us of the principles for which our country stands, and they remind us of the courage and commitment necessary to maintain those principles. They remind us of both the blessings we enjoy, and the cost we must bear, as citizens of the last best hope of earth. We owe them a debt which we can never fully repay, but which we must always strive to repay. We owe them decent health care, and jobs, and education…we need to address the problem of homeless veterans, we need to help all of our veterans heal their emotional scars, and especially, we owe them our respect. Above all else, we owe them our commitment to dedicate ourselves to the never-finished work of building a nation that continues to be worthy of their sacrifice. At a time when our great nation can seem so divided, a casket draped in our flag, or a man or woman in uniform saluting it, should be images that remove all divisions among us. The person who wears our country’s uniform is no longer defined by political party, nor race, nor religion, nor gender, nor economic status. That person is an American patriot. And if that patriot shall not have sacrificed in vain, then we must find it in ourselves to set aside our own differences and resolve, truly, to be one nation, under God, indivisible, with liberty and justice for all. May God bless all who have served, bless the souls of our departed, give strength to those who’ve been wounded, bless their families, and always bless the country for which they sacrificed. This week, I was so proud to lead the City Council's Salute to Veterans to honor the outstanding service of Angelenos who not only served our country in uniform, but continue to be pillars of strength and service in their communities today. Fourteen veterans from across the city joined the 2016 class of Veterans of the Year. 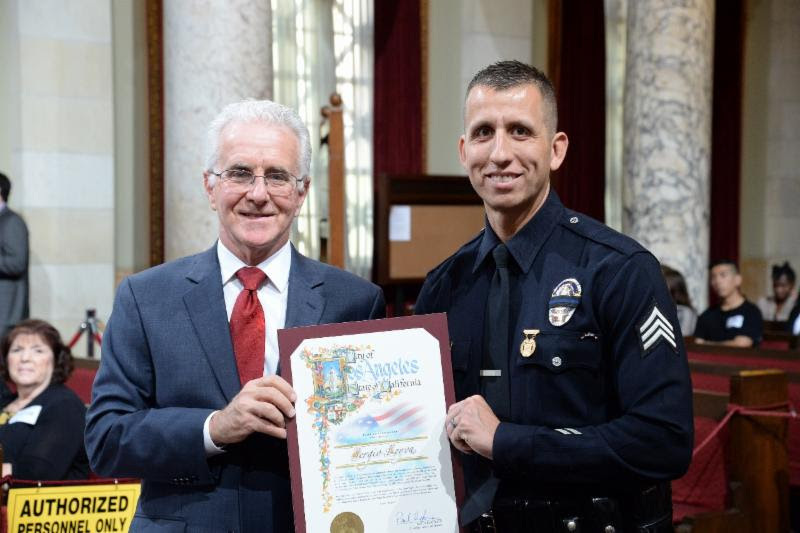 I had the pleasure of honoring LAPD Sergeant Sergio Leyva on behalf of the Second District. A former Army Ranger in Iraq and Afghanistan and current LAPD officer in charge of the North Hollywood Senior Lead Office, Sgt. Leyva served with distinction in the Army's Special Operations unit, 1st Battalion 75th Ranger Regiment. He was awarded the Army Commendation Ribbon, Global War on Terror Expeditionary, Afghanistan Service medal, Iraq Service Medal, Valorous Unit Award, Joint Meritorious Unit Award and the Presidential Unit Citation for his service.